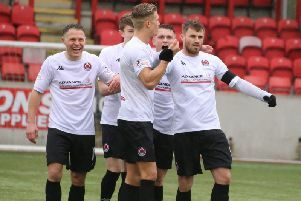 Clyde left Berwick disappointed after being forced to settle for a point after a 1-1 draw against their promotion rivals. Sean Higgins gave the Bully Wee the lead after 18 minutes before Steven Thomson netted an unlikely equaliser a minute before half- time. Clyde had the lion’s share of the chances but failed to capitalise, whilst Rangers were reduced to ten men when Michael McKenna was sent off in the 88th minute, shown two yellow cards in a matter of seconds by referee Greg Aitken for a foul and dissent. As early as the second minute, Matthew Flynn headed over for Clyde from a cross on the left. Peter MacDonald then chipped the ball over the top after another break and cross down the Clyde left. The visitors took the lead after 18 minutes when Scott Linton crossed in from the right and Higgins found the net with a touch from eight yards out which Kevin Walker got a hand to but could not keep out. Two minutes later Higgins went close again when he lifted the ball onto the roof of the Rangers net. Walker went full stretch to deny Flynn and from the resulting corner Steven Thomson was forced to clear off the line. Walker was eventually forced to leave the field after 39 minutes, replaced by Sean Brennan. On 44 minutes Berwick got an unexpected equaliser when Clyde keeper John Gibson punched a high ball into the box. It fell into the path of Thomson who rifled in a 30 yard shot with Rangers’ first effort on target. Early in the second half Gibson saved well from Greg Hurst as Berwick started with more purpose, before Flynn got in for a header which went close for the Bully Wee. Moments later Flynn went even closer, when he chased down the ball, only to see his shot beat Brennan but come back off the outside of a post. Brennan then had to save low from a drilled shot by Higgins as Clyde tried to turn the screw. Former Berwick player Ewan McNeil fired in a half volley which Brennan did well to collect, whilst at the other end Rangers found themselves three on two, but Darren Lavery’s effort was saved by the legs of Gibson. Late in the game, with Clyde pressing, Berwick were put under further pressure when McKenna was shown two yellow cards in the space of a few seconds for a foul and dissent, but they managed to hang out for a point.